A bit of safety advice for travelling in the Netherlands: Look both ways before you step off the curb.A bit of safety advice for travelling in the Netherlands: Look both ways before you step off the curb. A speeding car is not your problem. It’s a bike that will get you! They’re everywhere and everyone’s on them. Kids off to school. Commuters heading to the office or the train station. Uni students carrying groceries. Young parents towing littlies in a home-made trailer. 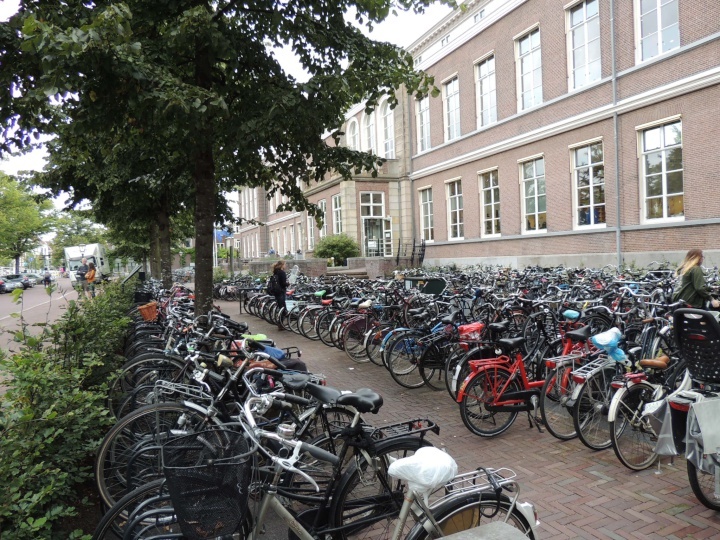 I had a week in Leiden, a lovely university town not far from Amsterdam, last Northern summer and it was a joy to behold – a crash course on sustainable transportation and just what’s possible. Trains in the Netherlands run quickly, quietly, and on time. They go everywhere. Cars don’t rule. If you want to park your car on the street in Leiden, it’ll cost 45 euros quarterly for a permit and good luck finding a spot near home. But, oh, the bikes. I rented one for five days and it was real flash – it had three gears! The old one-speed push bike of my youth dominates the market. Built for comfort, not speed, they get you there faster than on foot, and cheaper and easier than driving. The infrastructure for cycling and the pancake-flat terrain encourage pedal power. There are cycle underpasses, passing lanes and stop lights. I rode to The Hague one afternoon – about 40 km round-trip on bike paths all the way – without a map, just following direction signs. 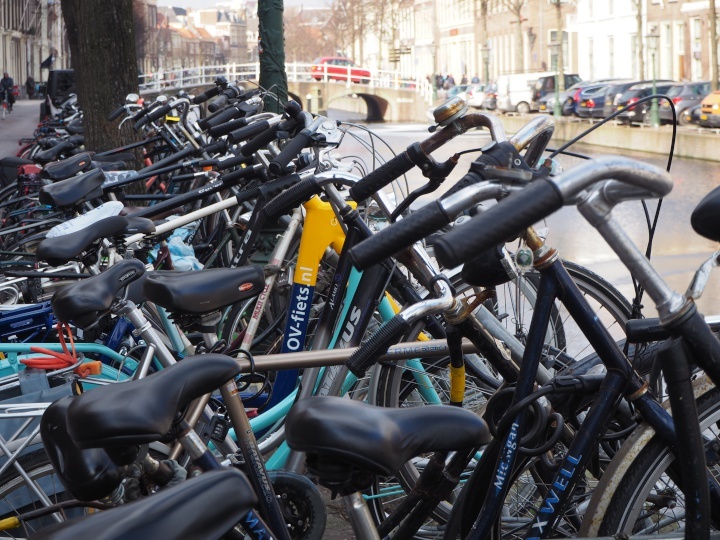 As for bicycle ownership, there are more bikes than people in the Netherlands. And if that’s not enough there’s the OV-fiets bike rental service – an extension of the public transport network. The hire rate is reasonable and they’re great at the end-of-journey. You can get a bike at a train station, for example, ride to your destination, and hold it for the return trip. Or you can pedal around between appointments. Brilliant. The Netherlands, of course, is not alone in its efforts to get (or keep) people out of cars. ‘Boris bikes’ in London shot to early fame (launched when Boris Johnson was mayor). Now known as Santander Cycles, the service is popular with tourists and locals alike. The same goes for Citi Bikes in New York (“12,000 bikes. 750 stations. 60 neighbourhoods.”) and Paris and Melbourne Bike Share services, to name just a few. We have cities and larger towns around the country that could draw on these examples to put a bike share scheme in place. We have some hills, yes, but that’s no excuse for not getting started. And then there are electric vehicles (EVs). So back to the Netherlands and a community in Utrecht where the future is now. A start-up is addressing fluctuations in solar energy supply and supporting the growth of distributed energy (more solar panels on more roofs) by tapping into the extra electricity storage available from EVs. Battery packs of local EVs are used to store cheap solar power during the day, with the excess beyond travel needs fed back into the grid to serve local homes once the sun goes down. Expanded widely, this method is seen as the basis of a national energy system replacing coal plants. Such innovation is far beyond our current thinking in New Zealand, but we are making progress. Drive Electric (see ‘More Info …’) is a non-profit organisation with a goal of making electric vehicle ownership mainstream. Flip The Fleet is a community project also aiming to accelerate the uptake of EVs by providing scientific data, informing the discussion, and connecting EV owners and other stakeholders. The Energy Efficiency and Conservation Authority (EECA) calls EVs safe, simple, clean and cheap. Battery range is generally a non-issue as 90 percent of car travel in New Zealand is less than 90 km. By EECA’s calculations, using residential electricity off-peak means you can charge an EV at home for the equivalent of about 30-cents a litre. Efficient and affordable public transportation, pedal power and electric vehicles, bike-sharing and car-pooling. The old and the new. And supportive policies for all of them. These are the building blocks of sustainable transportation now and for the future. It can’t come soon enough. Gord Stewart is an environmental sustainability consultant. He does project work for government, industry, and non-profits.